You may have heard “CBD” before and wondered what it is. CBD Oil is all the rage these days and it seems to be getting quite a lot of attention for pain relief, anxiety relief, and even helping those with insomnia. CBD Gummies are a popular way of ingesting CBD oil for their potential medicinal benefits. I will share the full scoop below. 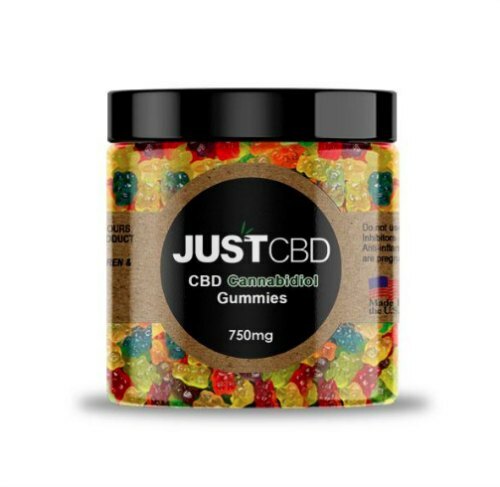 This post is brought to you in partnership with Just CBD and includes a CBD gummies review. CBD Gummies are edible candies that are made with CBD (Cannabidiol) Oil as an ingredient. CBD Oil is oil extracted from hemp (not marijuana so it does not have the psychoactive qualities found in THC). The FDA considers hemp and hemp-derived extracts to be food-based products. As such, CBD is completely legal in all 50 states. CBD gummies are created for those looking to get the benefits of CBD oil without without sacrificing taste. One thing that is really important to know as a potential consumer is that all CBD oils and CBD gummies are not created equal. The purity of the CBD oil can vary greatly so can the disclosure about exactly what is in the products. That is one of the things I really like about Just CBD. They use premium grade hemp, produce all products in the USA, and share lab tests for each product that prove the purity and potency so you know exactly what is in the CDB gummy. 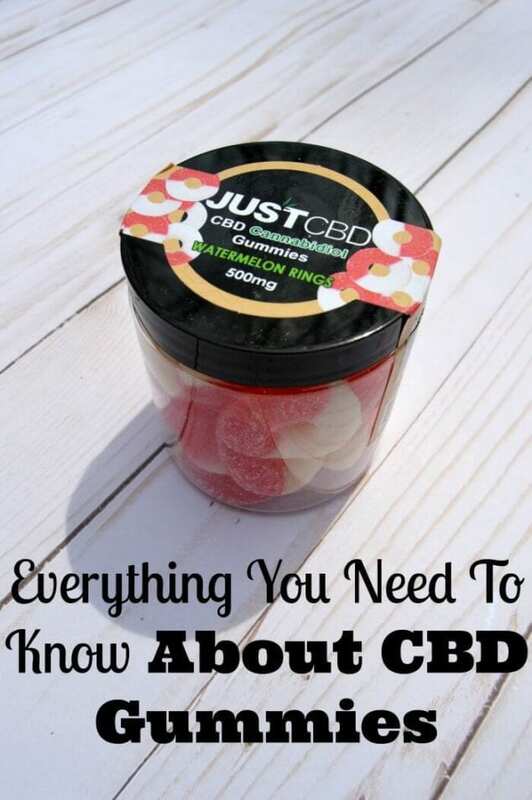 This may seem obvious but I still wanted to point out that CBD gummies are not to be used as just candy and should not be left around where children may see them and think they are just candy. I was provided with a 500mg jar of CBD Gummies in the Watermelon Rings variety (about 25 rings). These CBD edibles offer almost 25mg of CBD per piece and Just CBD uses 99.99% pure CBD so I know that I am getting the best quality, most potent CBD. Now what would I use these CBD Gummies for and how do they taste? Well, they taste delicious. If I didn’t know they had CBD oil in them, I probably wouldn’t have noticed the slight flavor difference. I tried these CBD Gummies out for anxiety relief and mood improvement and I think they really help. I am normally a very even keeled person but I have been struggling with emotional swings, depressed mood and increased anxiety for several months. I know why and I have been trying to eat well, get exercise, and take my vitamins, and that all helps but sometimes I still struggle. I use just one CBD gummy watermelon ring when I am feeling overly anxious. I don’t feel any huge mood shift but I do feel better, less worried, less depressed, not bothered. Sometimes, just a boost up out of the funk is all you need. I am excited to have these CBD gummies from Just CBD on hand so I have help for days when I need it. Looking for something more research-based than my CBD gummies review? Well, a case report published by The Permanente Journal in 2016 revealed that cannabidiol might be a safe treatment for the anxiety and insomnia associated with post-traumatic stress disorder. I don’t have any chronic pain for me to be able to review the effectiveness of CBD Gummies on pain relief. However, I can tell you that after 3 days skiing and several falls, I was feeling pretty sore all over and my CBD gummy watermelon ring helped me forget all about it. 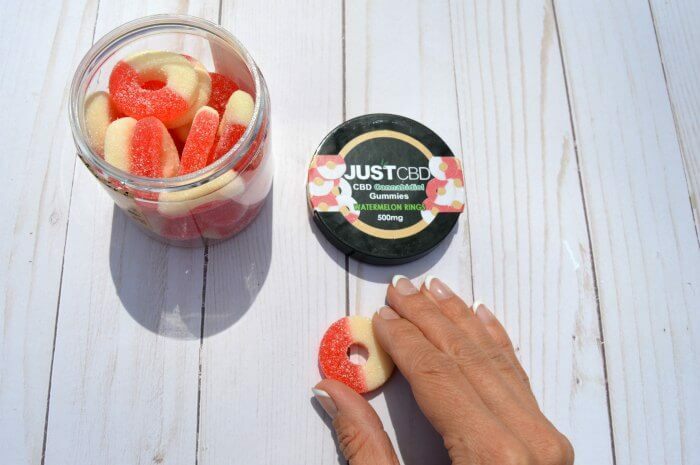 The Just CBD watermelon rings have the classic taste of the sour and sweet watermelon and a jar offers days of relaxation and stress relief when you need it most. I didn’t notice any side effects at all to the CBD Gummies. However, they do have CBD oil in them so possible side effects of that are anxiety, changes in appetite, changes in mood, diarrhea, dizziness, drowsiness, dry mouth, and nausea. I do believe that using a pure CBD oil is important in this area. I really like how they show lab test on their products that prove purity and potency. It is good to know you are getting what you are paying for. Plus, you can use this JUST CBD promo code, “cbd20” for 20% off! Now, that’s a sweet deal! How To Enter: Just sign into the Gleam widget and click the entries you want to complete for your chance to win. Open to residents of the USA, 18+. Email entered into the widget will be kept private. Winners announced above in the Gleam widget on April 22, 2019. Winner will be selected randomly. I will notify by email and winner must respond within 4 days or the prize will be forfeited and alternate winner will be chosen. I hope you found this CBD Gummies review informative. Have you tried CBD edibles before? For what type of conditions did you find them most useful?